In late 2011, a small team of psychologists, engineers and entrepreneurs in Palo Alto, California set out to build the world’s best tool for eating disorder management. Building on a platform of decades of Cognitive Behavioral Therapy and self-monitoring research, we sought to deliver ‘what works’ in an engaging and elegant way on mobile devices. 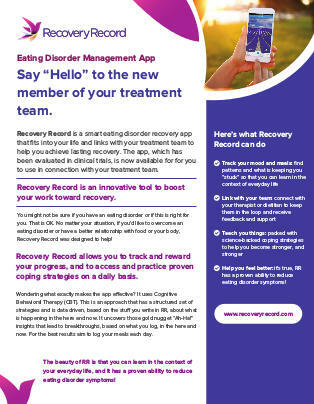 A simple observation - that the tedium associated with pen-and-paper monitoring detracts from treatment engagement - evolved into Recovery Record, the world’s number one mobile application for eating disorders. As thousands of people became engaged, they wanted to share their progress and collaborate with their treatment team. One day it dawned on us, what if the rich patient data being collected was placed in the hands of treatment teams? That’s where Recovery Record Clinician comes in. We’ve created a mobile-first patient management experience from the ground up - challenging assumptions about how clinical decisions are made, and designing an interactive and integrated treatment platform. We’ve taken the very best experiences from the apps we use everyday and applied them to best practice treatment methods. It’s a new, time saving, efficiency-creating model for treatment delivery. And it is deployable in minutes. The Recovery Record system has attracted over 10,000 eating disorder treatment professionals and 600,000 people living with eating disorders. And that is just the beginning. Our goal is to put Recovery Record in the hands of the millions of people worldwide who need it and want it. That means partnering with treatment providers, health plans, and research institutes, adding new features, and continuing to scale and innovate quickly. Thank you for joining us on the journey to transform eating disorder care. We’re very excited for what lies ahead. © 2019 Recovery Record.All Rights Reserved.